Some of the region’s largest employers have been challenged to fill key vacancies due to a shortage of labor with the required skills. To better understand factors behind this imbalance of labor supply and demand, and begin development of a coordinated approach to talent development, a consortium of human resources executives from these companies commissioned the UB Regional Institute conduct a comprehensive analysis of employer skill needs. 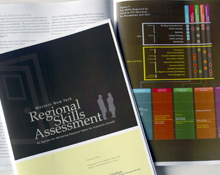 Based on data analysis and consultation with company leaders, the institute identified region-wide skill gaps and developed a series of action steps for companies and regional partners to begin to fill these gaps.